As far as the recipes go, there are the obligatory nikujaga, karaage and yakisoba, but the artwork helps you to overlook these typical inclusions. It’s the fun and very unique Japanese/Spanish/European food fusion that makes this cookbook sizzle, from ham and cheese pot stickers, miso-marinated mozzarella and tofu quiche with smoked salmon. These kinds of recipes tap into a style of cooking for people who don’t happen to live in Japan and have certain key ingredients easily available, conveniently allowing for preparation matching the time and place. 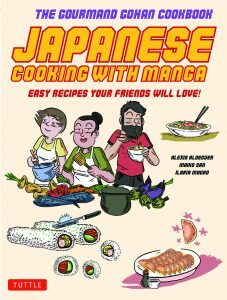 Through the pictures and anecdotes, Japanese Cooking with Manga reminds us of the universal bond that food helps to create, and that the act of preparing and eating together is an everyday ritual that we should all think about and enjoy more, as these characters are having fun and enjoying a delicious life. Readers are also reminded of culinary and cultural similarities and differences (from a non-Japanese character: “You will never get me to like tofu!”), and the book gently acknowledges that despite the popularity of Japanese food, the ingredients or cooking process is still new to many and may need to be adjusted to match local tastes. 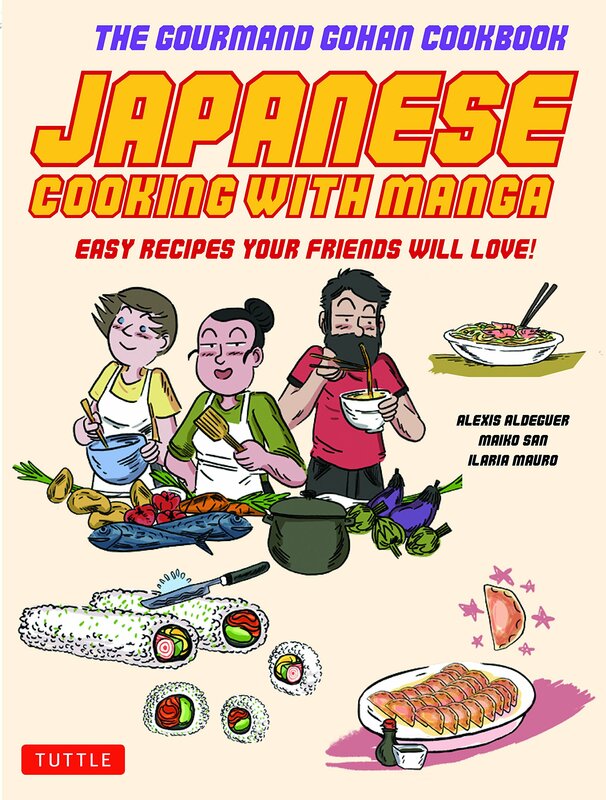 Japanese Cooking with Manga is an entertaining introduction to the world of Japanese food, and an approachable book for those interested in learning more about Japanese food culture. While it may not become your go-to cookbook for a washoku master class, it is a stepping stone—one to make you smile along the way as you dig deeper into Japanese cuisine. For more on Japanese Cooking with Manga, click here.